Salish Kootenai College Brand Style Guidelines – This is the Salish Kootenai College Brand Style Guide. This site will provide you with the means to properly display and reproduce the marks of SKC. 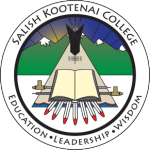 The Salish Kootenai College Brand Style Guide is the source for information regarding the best uses of the SKC Seal, the Charging Bison logo, official SKC Colors, and official SKC fonts. Consistent adherence to the Guide will ensure that the College is represented professionally and with a consistent appearance that constitutes the SKC Brand. As part of the Purchase Order process, all advertising and marketing materials must go through the "Green Light Review" process. Find out more about the process here. This style guide is provided so staff, faculty, the community, and vendors use the SKC Seal, Charging Bison logo, colors and fonts in a consistent and predictable manner. If the marks are used in the same way in internal as well as external communication, the image of SKC attains greater consistency leading to increased recognition. SKC staff, faculty, and campus organizations are stewards of our community’s perception of the College. SKC’s underlying Mission, Vision, and Values are represented by the way we talk about the College and represent it with our actions, as well as the way in which we visually communicate in media and publications. The marks, colors, and fonts that have been chosen to represent the College have, in some cases, been used for many years. Generally, a great deal of effort and thought has gone into their creation and adoption. A consistent presentation can help assert the conception that we are the pre-eminent educational center of excellence for American Indian Students. Uniform use of the SKC Seal and Charging Bison allows us to reinforce the legacy of SKC. Download SKC Brand Style Guide PDF Here.